You would have to have been around Jon Crick during the whole of his broadcast engineering career to appreciate the enormous breadth of his talents and experience. He fixed fixed radio and TV transmitters, enormous videotape machine pneumatic systems, digital videotape recorders, big audio mixing consoles, the Sony Library Management System robotics and studio camera robotics. He operated satellite news trucks big and small, wired 100-amp UPS devices, planned multi-camera shoots, and installed production switchers. The documentation was always before he started a project. Then there are the multiple musical instruments Jon can play with complete competency. I met Jon Crick when I started at KFMB in 1990 and had the distinct honor of being able to work with him again at XETV from the time he followed my move there in 2005 until I left in 2010. He retired from channel 6 in March this year. How did you make the jump from Taco Bell store manager to KFMB engineer? Did you have any formal electronics training? I minored in Industrial Arts at SDSC (now SDSU), and my primary emphasis was electronics, with a secondary emphasis in woodworking. I worked at Taco Bell on and off for nine years to help pay for college and supplement our income in the first few years of marriage. Right after I graduated, my first wife Flory and I moved to Japan for two years to study with Dr. Shinichi Suzuki, of Suzuki Violin fame. When we got back, I finished my teaching credential and taught at Granger Jr. High, Point Loma High, and Baker Elementary, where I started the elementary instrumental magnet program for the San Diego school district. I also completed my master’s degree in music during this time. We didn’t have enough income to afford a second child with my teacher’s salary, so when my father-in-law, Bob Crotinger, retired from KFMB, I filled the opening in radio engineering, working with Bob’s long-time friend and colleague Carroll Hutchings. My starting salary at KFMB was 150% of my teacher’s salary, and with overtime, I actually made double what I would have made had I continued teaching that year. Before I started working full time at KFMB, I already had [an FCC First Class Radiotelephone] license and was hired to man the AM transmitter for a month and take hourly readings while new towers were being built. It was a two-tower array back then, and with only one tower operating, the FCC insisted that we operate at a reduced power and have the transmitter manned. One evening the old RCA BTA-5G quit, and I happened to remember how to patch the Bauer 707 to get the station back on the air. I think that event cast a favorable light on my application when I applied for full-time work a few months later. Or maybe I was hired because the chief liked the way I tuned his piano. Who knows? 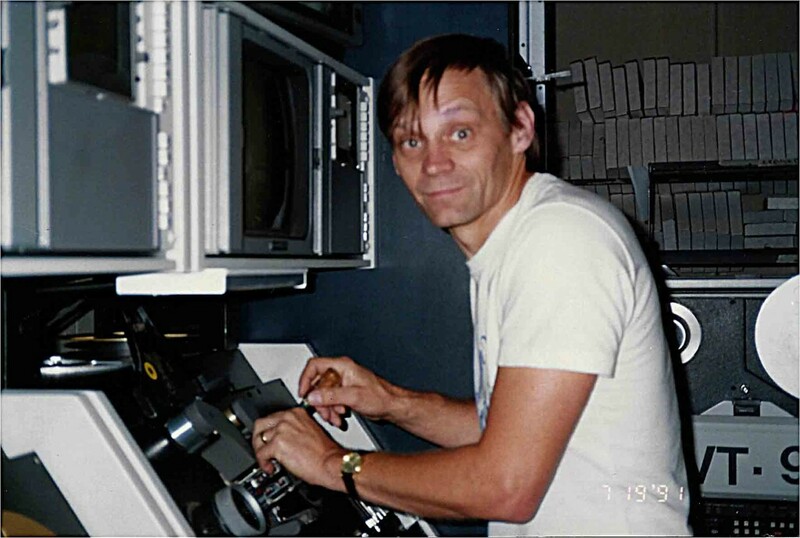 Jon Crick maintaining Ampex videotape machines, about 1990. What did you do in the 1980s at KFMB? For the first year and a half I worked studio and transmitter maintenance for KFMB-AM and KFMB-FM. My largest project during this time was to design and build a stereo summing switcher, which would enable any combination of radio studios to go on the air for either AM or FM, or both. After that, I moved to TV and did transmitter and studio maintenance (primarily 1″ and 2″ tape machines). I knew the electronics theory pretty well, but the practical knowledge of dealing with the problems and solutions of broadcast engineering I got from Hutch, Rich Lochmann and Rick Bosscher. The story I regularly tell about you is your completely dismantling an Ampex ACR-25 automatic cartridge video recorder about the size of a large refrigerator retired by KGTV to use for parts by KFMB for many years thereafter. You had the parts all cataloged and shelved, from large modules to relays and ICs. Yeah, the ACR had two sides, and by taking parts from both I was able to rebuild one complete set of working sub-bases. To test them, I installed them in the backup ACR (VT-14), and for a few weeks, the B side of that machine was built entirely from units from the old KGTV machine. When we replaced the ACRs with the Sony LMS, the spare sub-bases and our primary ACR (VT-13) were sent back to Midwest Television’s station in Illinois. VT-14 was to be sent to that great recycling center in the sky (well, OK, it was was the parking lot), and once we got it all disconnected, the director called out over the intercom, “Roll 14!”. And we rolled it right out the door! I also have fond memories of working as a team with you and the others at KFMB to construct rather large projects, like moving the production and master control rooms. Those were really exciting times! And we had a lot of very talented engineers there at KFMB, yourself included, and we pulled off some minor miracles, considering the obstacles we were often faced with. Other projects I recall were: installing the LMS to replace the ACRs, the building of Digital Post, installation of the Philips router and Clearcom intercom (you did most of those two), remodel of the news studio, installation of the TSM robotic camera pedestals, retrofit of all the Audiometrics audio DAs with an external DC power supply, engineering the coverage of the RNC in 1996, replacing all of the 12″ overhead cable trays in the equipment room with 24″, and replacing the main UPS. You’ve been vocal about corporate greed with respect to worker pay and the stream of layoffs we’ve seen over our careers. The appearance of greed in the actions of upper management at the direction of the owner certainly did trouble me, but is only a symptom of a deeper problem: the adoption of an attitude of disregard and even disdain towards those who do the work that earns the wealth. I was surprised when you jumped ship from KFMB to XETV in 2005. I guess my innate (some might say inane) optimistic outlook kept me from recognizing the calloused attitude of ownership towards employees, but after about twenty years, it dawned on me that my work was contributing to the wealth of people whose values regarding appreciation and gratitude of others were contrary to mine, and I decided that if the opportunity came to go elsewhere, I would. The final straw came when we were asked to sign an arbitration agreement to [waive our rights to attorneys in employment disputes, and falsely sign that we were doing so voluntarily]. So when you offered me a position at XETV, although I knew I would greatly miss all of my colleagues at KFMB and would be taking a substantial pay cut and lose two weeks of vacation time, I really didn’t have to think about it very long. My experience at XETV was very different. I was absolutely delighted to see that the GM would regularly send out emails to the whole station when he found out about someone doing something he thought praiseworthy. And this attitude of appreciation was apparent in most of the people working there–email kudos were commonplace from many others. I have to say, when I first started at XETV nine years ago I was blown away by the professionalism and passion for excellence that I saw here: having rehearsals before the start of a show; having show meetings afterwards to discuss what can be done better; being quick to send out heartfelt kudos when a fellow employee has done something exceptional; doing your very best, so that everyone else can do their very best—these are an integral part of the culture I see here, and they have made working at XETV just a joy for me, and I thank you all for that gift! So thank you all, for all the inspiring and sweet memories, and until we meet again, may God hold you in the palm of His hand. Another story I tell about you occasionally is how you saved a news show with little time to spare at XETV when the production switcher broke down shortly before the 10pm newscast. This was during the Christmas season, as I remember. The Philips DD-35 switcher? I do remember that when I inherited the job of maintaining that switcher I discovered that there had been no updates done to it since it was purchased, and we jumped over 43 version updates in one fell swoop. We almost lost a newscast, but managed to cobble enough resources together to do the show. It took a full week before the thing finally settled down. The other occasion you might be thinking of was when the Ross Vision switcher was given an update and just wouldn’t come back up, and couldn’t be reverted back to the old version. We still had the old DD-35 set up in the second row, so we patched it in and ran the show with it. And it was a clean show! Amazing! In both of these cases, it wasn’t me that made it happen, but was the result of the whole production staff just knowing how to work as a team and get things done. One of the things I have admired about your work is your dedication to keeping the systems documentation current. I had a great teacher in that regard–yourself! I made use some of my own inventions, but the fundamentals were copied from what I saw you, and also Derrik Cullison, produce in the construction projects you mentioned above. Unlike many broadcast engineers, your activities outside of the station were always about music and church, not ham radio or computers. I did make an attempt at getting a ham license while living in Japan so Flory and I could talk with her dad (Bob Crotinger–K6PC), but although I could send 25 wpm, I struggled to be able to receive 5 wpm (‘Tis easier to send than receive). I didn’t have the time to practice enough to get my speed up, and finding a place to take the test in Japan for a U.S. ham license was a bit of a problem as well, so it just never happened. While in Japan I had one other ham radio related adventure–importing a Henry 4K linear amplifier for a Japanese friend who was a ham (JA0LU). Once he got it set up, he made contact with K6PC for us and we all had a great time talking across the Pacific on 40 meters. Computers are another story. I built an analog computer from a kit when I was in elementary school, started college majoring in electrical engineering with an emphasis in computer science, learned Fortran programing with punch cards on an old IBM computer, and then later, BASIC and 6809 assembly code on my Radio Shack Color Computer. (My Color Computer had a whopping 16K of memory, and when I upgraded to 64K, I really had no idea what I was going to do with all that space!) I wrote several educational programs for my boys after they were born, so up to that point, I was a pretty avid computer hobbyist. Church has been very important to me ever since I accepted God’s plan of salvation through Jesus Christ back in college while attending old First Baptist Church downtown. I’ve always enjoyed an active role in the churches I’ve attended: singing in choirs, playing solos, playing in church orchestras, attending Bible study, driving a church bus, occasionally teaching Sunday school, serving as a deacon and elder, reading scripture in the service, you know–like that. Now that I’m retired, I’ll also be able to be help out in the administration and building maintenance of my church, and I’m looking forward to that. Music–I love music! Always have, always will. There’s just something about singing or playing music, especially with others, that makes life meaningful for me. I can’t think of any human emotion, mundane or profound, that cannot be evoked through music. It will always be an indispensable part of what I do, and who I am. Do you plan to continue playing and/or teaching music during retirement? I’m already pursing the music part–in fact, on my last day at XETV I had to leave early because I had a rehearsal for a production of West Side Story that evening. It was only a couple of hours, but I guess you could say I took an early retirement! Besides that, I’m also singing in a Barbershop Chorus (El Cajon Music Masters), playing for the Mesa College Band, the UCSD Wind Ensemble, the San Diego Clarinet Quintet (sdclarinet5.com), and have been playing Japanese flute (shakuhachi) for cultural events pretty regularly now. However, my #1 priority in retirement is to spend more time with Lynne, second is to finish my house, and third on the list is to begin assuming the responsibilities for building management of my church. After that, more playing and arranging of music, maybe some teaching, maybe a little travel. You had a tough divorce, but then you found and married your high school girlfriend and fellow musician. There’s a story with a happy ending. Lynne was my college sweetheart, and after we each married someone else, we hadn’t heard of one another for over 35 years. We found each other again when I was asked by Dr. Bob Bunyard to teach recorder to the kids in our childrens’ choir at church. He called me a couple weeks after I agreed, and told me he’d seen an advertisement in the paper by a lady selling 35 recorders, and asked me to check them out. Well, it was Lynne who was selling them! I checked out the recorders, checked her out, and five months later we were married! We celebrate our 10th anniversary in May. You say you plan to continue working at XETV part-time? Only for a short time–one day a week to help finish some projects that didn’t get done, and to cover for vacations and NAB. By mid-April I expect to be only going in for special projects, so I should start to feel like I’m actually retired sometime in May. Would you recommend broadcast engineering as a career now? I would–to someone who finds broadcasting fascinating, has a good aptitude for electronics, enjoys solving problems, and loves working with people. True, there are far fewer opportunities now than there used to be, but it’s a job that never gets boring–there are just so many different things you find yourself doing in this business: repairing a wide spectrum of electronic equipment, designing and documenting systems, installing and integrating new equipment into those systems, training operators how to use the new equipment, setting up a small studio for special events (like elections), climbing towers, trudging through snow banks to get to the transmitter building (I’m thinking of a photo I once saw of you)… that kind of stuff. And the people you work with in this business are perhaps some of the most interesting you could ever expect to run into!